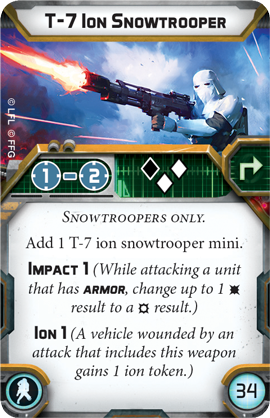 I know they've been out for almost a month now, but we need to talk about Snowtroopers! Haven't gotten a good picture of them in action, so have the pic I took at Worlds. Snowtroopers are the second Corps unit the Empire has access to, and so it is really most fair to compare them with their Stormtrooper counterparts. At 48 points, they are slightly more expensive than the Stormtroopers, but not noticeably so. In fact, at a brief glance, most of the stats for the units are pretty much the same. 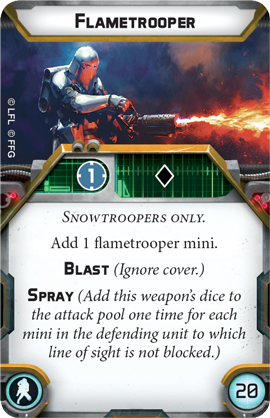 For offense, they also have a surge to hit, combined with their not-very-good E-11 Blaster Rifles, which toss 1 white die per mini, at .375 damage per die. 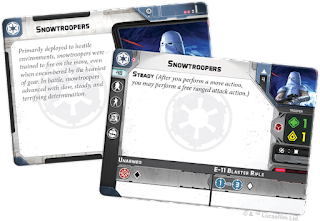 While the Stormtroopers get assistance with their Aim tokens, the Snowtroopers instead get the ability to make a ranged attack after moving with Steady! This means they can advance and reposition themselves, even under suppression. And if not suppressed, they can aim or move twice. However, they only have a speed of 1, meaning they won't be winning any foot races. 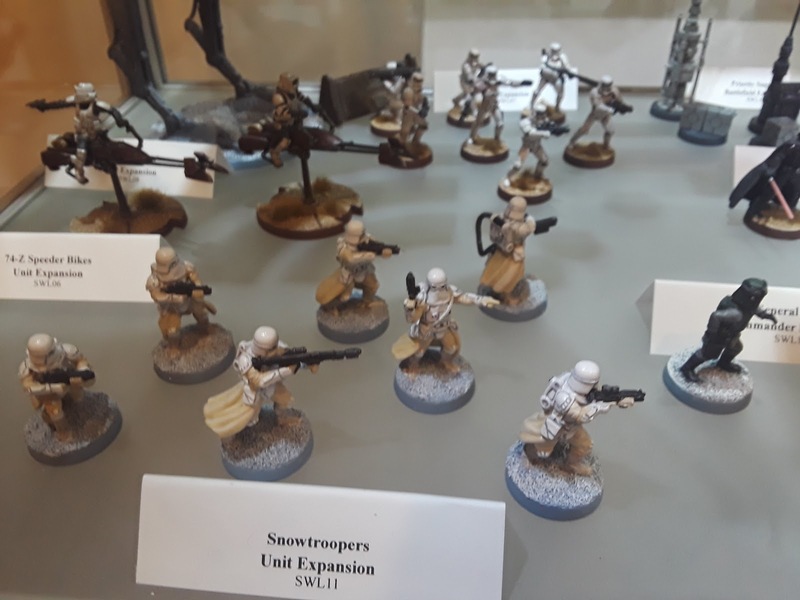 Also much like the Stormtroopers, they have 1 black die for melee, making them much better at giving a beatdown if they close with their opponent. For defense, they have no surges, but a Red die for their blocks. One health per mini and 4 minis per unit means they will still get wiped out fairly quickly, though you'll probably be increasing that total unit health by bringing along a heavy weapon, or extra troopers. Also, they have the standard courage value of 1, so they will need a commander nearby to keep from panicking. The heart of this unit is the upgrades, and you can bring with them 1 Heavy Weapon, 1 Trooper, 1 Equipment, and 1 Grenade upgrade. I am shocked, a trooper upgrade that adds an extra generic mini and costs exactly 1/4 of the point cost of a 4 mini unit. It's a good upgrade! Range 1 isn't a great range, sure. But Blast and Spray are both really, really good, and when you put both of them together you get a crazy amount of average hits and expected damage. Basically the weapon has a 41% chance of eliminating any particular rebel trooper, and a 31% chance of doing the same to an Imperial unit. That's per mini you're shooting at. Assuming a 5 mini unit (and a full strength squad of Snowtroopers), you're looking at an average EXPECTED DAMAGE of 2.31 for Red dice and 3.05 for White dice + surge. Not hits, damage. That's a lot of pain to put onto any given unit. There isn't anything else in the Corps slot that can straight up delete enemies like that, short of a Scattergun Fleet Trooper team catching someone in the open. You're paying the premium here for Ion 1 and Impact 1, and in addition to points you're also paying for the opportunity cost of bringing the Flamethrower. 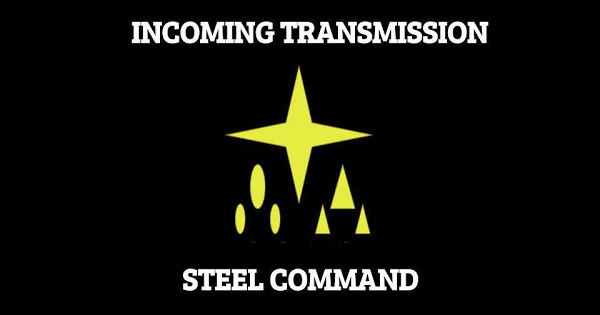 Still, this gives the Imperials access to Ions, which as suppression for vehicles is actually a pretty good deal. You're not looking at a large boost to damage, only 1 average hit over the standard shot, and you get an exhaust as well. Range 2 is also a major drawback. It seems like I'm shitting hard on this upgrade, but Ion is really good at foiling high value target, so don't immediately discount this upgrade, especially if you're going to be looking at a lot of AT-whatevers. You've got Flamethrowers for Blast. Leave this home. Move, move, chuck .625 hits per mini with Impact X. A quality upgrade that makes your flamethrower units even more scary, and your T-7 Ions crippling. If you're even sniffing armor, this is a must take, and it's a strong contender even if you aren't because you're getting even more black dice to add to Flamethrower town. You might as well just sleeve this upgrade with your Snowtrooper card. Not a bad thought, especially if you're thinking Aim > Move > (Free Action) Shoot, or if Veers is hanging around. Precision 1 puts them in line with Stormtroopers in terms of Aim rerolls, really helps the White attack dice and is very, very good with Black attack dice. By the time you slot this in, the unit is getting kinda pricey, but what is cost when it comes to straight up wiping enemy units from the board? I don't feel like these guys need to get high up like Stormtroopers and their Range 4 weapons do. Probably best to leave this one behind. No. You can only go Speed 1 to begin with. Leave this behind for someone that can actually move at a decent speed. Wondering what to do with these guys? Do this. Point them at an objective, and watch your opponent scramble to figure out a way to stop them from running up to it and flaming anything in their way. That's a lot of damage walking steadily towards you. Let Vader motivate them into moving 3 times and shooting. Your Rebel opponent's Flame AT-RT wishes it had that ability. Grab two of these guys and get ready to harass vehicles. What they won't kill, they can lock down. They can even do some anti-infantry work in a pinch, though not as devastating as the flametroopers. Let Veers refresh their T-7 with his command card, or have Vader find new ways to motivate them into reloading. No. Not worth it. Take a heavy weapon. If you're going to take a generic unit to do something like act as a meatshield for Veers, make it Stormtroopers. They can do it for cheaper. Gonna have to do this one later. Sorry. That's it for the Snowtroopers. We'll talk about Fleet Troopers and their ability to MURDER things next time. But regular stormtroopers don't fit a Hoth themed army or scenario, regardless of costs and abilities.